Where is the bad Hebrew tattoo, you ask? What's the deal with this piece of abstract expressionism, you say? 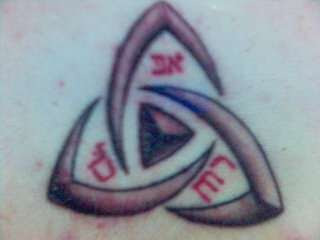 This is our Hebrew tattoo. Yes really! In fact, this tattoo that was supposed to say "Love" in Hebrew. It seems that the artist got somewhat carried away with tweaking the script, rendering the letters totally irrecognizable. Ugly, too. Unless you really know what you're looking for, this tattoo is for all intents and purposes just a random collection of lines. Do you see the resemblance now? No? Here's a visual aid. Take a few minutes, squint, turn your head this way and that way, it'll come to you eventually. Maybe. By the way, in Hebrew, you're not supposed to cut a word in half either! Tattooing your loved one's name in Hebrew is a very romantic gesture. Getting it wrong - not so much. Today's victim wanted a Hebrew tattoo of his own name (Brian, on the right) and the name of his girl (Angie - on the left), unfortunately, he managed to misspell them both. Brian - There's only one mistake, but a crucial one. He used the regular Nun insead of the final form (Nun Sofit). For letters which have a final form, the final form should always be used at the end of a word. Angie - Some creative spelling here. 3 mistakes in one small word, phenomenal. In English, G can be read two ways, as in "game" or as in "gentle". In old Hebrew, the sound G as in "gentle" or "Angie", didn't exist. In modern Hebrew it was artificially added by putting an apostrophe right after the letter Gimel. Do you see an apostrophe in that tattoo? The author had a hard time figuring out the "ie" part of "Angie", and decided to use the Nikkud (vowels - look for dots in the tattoo) as if they were letters. Bad idea. In Hebrew you only apply vowels to letters, you never use them as a standalone, never apply them to an empty space. Overall, don't attempt Nikkud unless you know exactly what you're doing. Most native Hebrew speakers don't dare mess with it, so you shouldn't either! Instead of that Nikkud disaster, the letter Yod should be used for the "ie" in "Angie". Some people really like to reinvent and personalize their religion. Take this mighty rebel for example. He doesn't have much use for Jesus, so he removed him from the trinity, replacing him with something far more useful. His Hebrew tattoo reads "Father, Spirit, Pillow". Since I'm writing this at 3:00 AM, I'm seriously considering to convert. How did Mr Rebel mess up like that? He managed to get both letters of Son wrong, turning "Ben" into "Kar". Yes, really. Today's victim thinks he has the name "Patrick" tattooed in Hebrew on his arm. He is quite wrong. 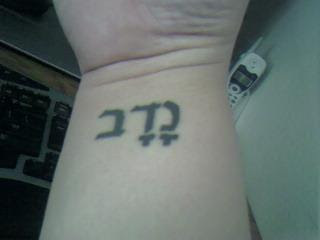 This Hebrew tattoo says "Nadav", which is a common enough biblical guy name. The name Nadav means Generous, Noble. The name Patrick means Patrician, Nobleman. But you can see the overlap, you say? That apparent overlap is false, because the noble in "Nadav" is that of "noble deeds" rather than "an aristocrat" as in "Patrick". This transformation of Patrick into Nadav is so loose, it can be barely traced. So you see, this guy is walking around with someone else's name permanently etched into his arm.